Scientific name: Sarcopoterium spinosum (L.) Spach. Synonym name: Poterium spinosum L.
Sarcopoterium, sarx, σαρξ, ρκοϛ flesh; Greek poterion a drinking cup, a goblet, a cup; Latin poterium and poterion. Lytton John Musselman, in his book "Plants of the Bible and the Quran", suggests Sarcopoterium spinosum to be the plant used for the crown of thorns placed on Jesus' head. 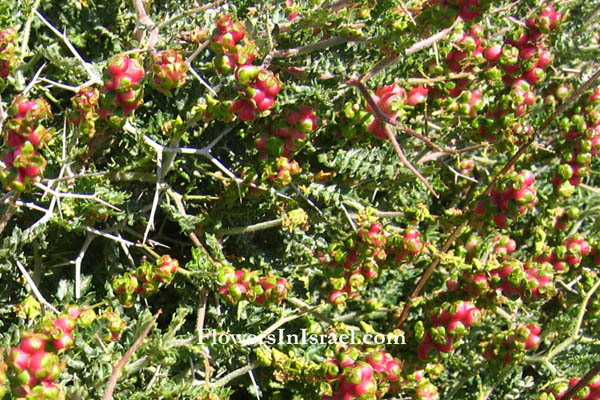 Sarcopoterium spinosum has thorns up to 4 inches long. It is a flexible plant that would be easy to weave into a crown. 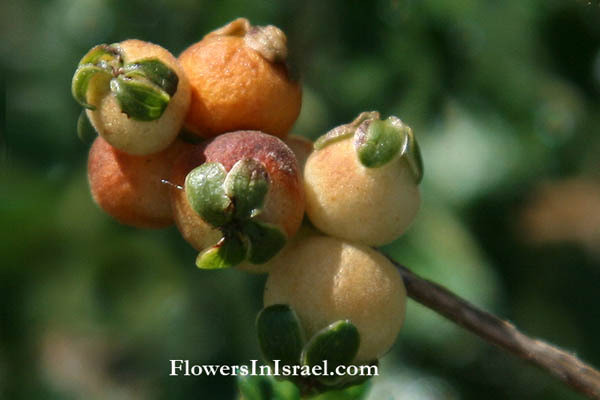 Sapoterium spinosum, Arabic ballan, which covers countless acres of bare hillside, was used all over Israel for ovens (Ecclesiastes 7:6) and lime-kilns. Before kindling one of these latter the fellahin gather enormous piles of this plant-carried on their heads in masses much larger than the bearers-around the kiln mouth. Thorns are usually woody plants, such as Acacia, Lycium, Ononis, Prosopis, Rubus, Sarcopoterium, while thistles are herbaceous, such as Centaurea, Notobasis, Silybum. Therefore I will block her path with thornbushes; I will wall her in so that she cannot find her way.